Lanza's Ave Maria redeems everything, however. Looking pale and very overweight, he enters a church where Sarita Montiel is quietly praying. Speaking (conveniently!) 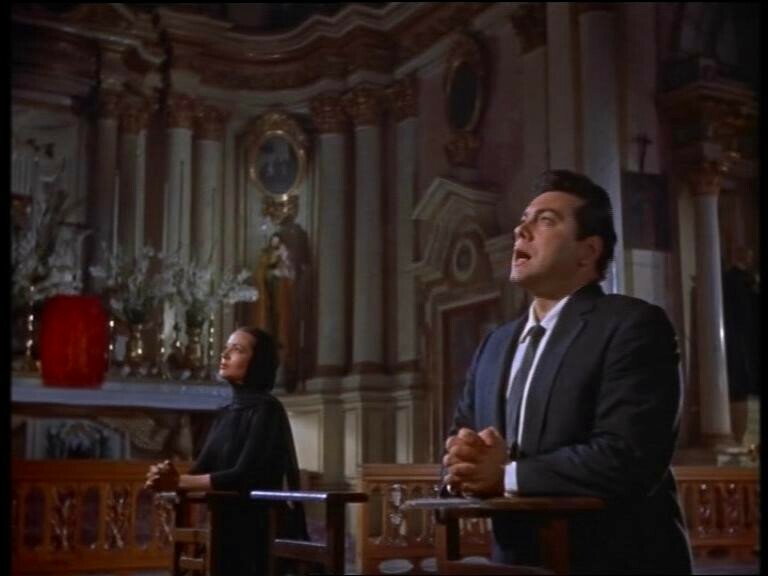 in English, her words visibly affect Lanza, and in a very subtle piece of acting, he kneels before the altar and quietly begins Schubert's famous hymn. This is the first time that Montiel's character has heard Lanza sing, and her reaction is beautifully captured. This is the first time that Montiel's character has heard Lanza sing, and her reaction is beautifully captured. Most impressive of all is the way Lanza looks at her at the conclusion of the piece, breaking her heart (and ours) with his simple dignity and sweetness. A sweet rendition of the title song follows shortly afterwards, together with a melodramatic storm scene. Avoiding the steaminess of the love-making depicted in the novel, the latter scene has its admirers among Lanza's female aficionados, but for my money something is amiss in its execution. 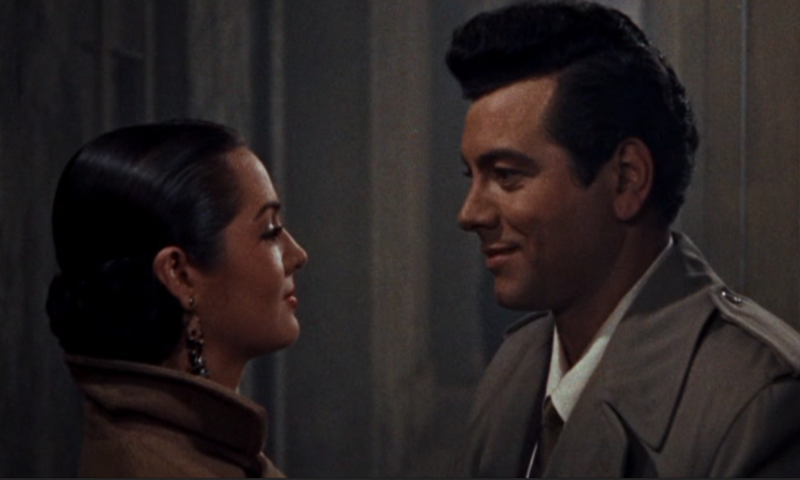 For one thing, Sarita Montiel appears to be running in the wrong direction as she rushes into Mario's arms, and passionate kiss notwithstanding, the whole scene feels too contrived to work as effectively as it should. 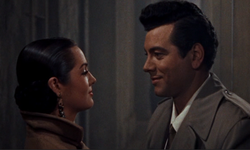 The final third of the movie takes place in San Francisco and New York, and it is at this point that Anthony Mann's direction becomes noticeably uninspired. The movie is already starting to feel long, and what is really needed here is a much more dramatic approach. To be fair, Mann is not helped by the scenarists' feeble plot resolution, but more about that shortly. Returning to San Francisco with Montiel (by now his wife), Lanza looks ten years younger as he stands outside the restaurant where he had once worked. "It seems like so many years ago," he remarks, and indeed it does. Once inside the restaurant, he delivers a superb "O Paradiso," which brings down the house. This was actually the final scene filmed, and Mario's handsome slimmed-down appearance led one journalist visiting the set to assume that the tenor was in magnificent physical shape throughout his latest movie. The final three scenes are poorly written and directed. In the first of them, Montiel threatens Joan Fontaine with a bullfighter's sword, but the scene lacks both credibility and drama, and we never feel for a moment that the latter is in any danger. There should be murderous intent in Montiel's eyes as she approaches Fontaine, and fast-paced editing could have given the scene some much-needed intensity. Seconds later, Montiel is rather improbably struck down by a bus while she stands on the road, screaming in advance - and seemingly waiting for the vehicle to hit her. The final scene is equally uninspired. While Lanza stands on the stage delivering a surprisingly strained rendition of the title song, his cousin (hammily portrayed by Harry Bellaver) cries out from the wings: "She's gonna be all right!" It's a feeble end to an otherwise robust melodrama, and it is tantalizing to consider how—with a little imagination and flair—the movie could have ended. Personally, I would have opted for a much braver approach. It might have been pushing the movie's luck as far as the censors were concerned, but imagine the impact if Montiel's character had killed the despicable Fontaine, and then been fatally injured herself? This is much more along the lines of the novel, and would have catapulted the film to instant noir status. Equally brave would have been the final scene with a now-bereaved Mario in a tribute concert to his beloved, tears streaming down his expressive face, as he sings the alternate title song (recorded for the movie, but inexplicably discarded): "We've got the night, we've got our love, we've got our se-re-NADE!" Soaring to the heavens, Lanza's singing has no equal on these final phrases, and it would have provided a thrilling ending. All criticism aside, though, Serenade remains a source of immense pleasure to me, and it is richly deserving of wider appreciation. I trust this tribute helps that process along.